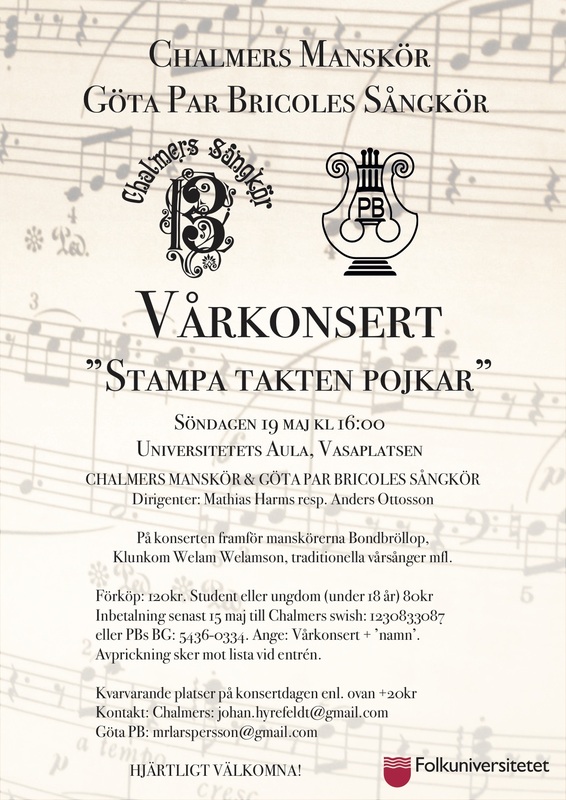 On May 19 the Men's choir and Göta Par Brocoles choir will have a spring concert in the assembly hall of University of Gothenburg. The choirs will perform Ett Bondbröllop, Domaredansen, Gott ist mein Hirt, other swedish spring classics and many more songs. The name of the concert means "Stomp the beat boys" and together we will stomp the beat along with the springs arrival. Welcome! Payment in advance is due to May 15. Send your payment to the Chalmers choirs swishnumber 1230833087 or Göta Par Bricoles BG: 5436-0334. Mark your payment with: Vårkonsert + 'your name'. When at the entrance of the concert we will check your name off a list.